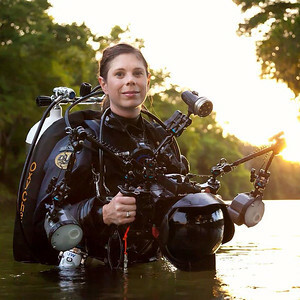 I am the first woman to dive 50 states and author of An American Immersion. My photography and articles are published in DIVER, Sport Diver, Alert Diver, SCUBA Diving, X-Ray Mag, Outdoor Oklahoma, SCUBA & H2O Adventure, and Texas Aquatic Science. My work has been featured in competitions and exhibits across the country. I am an accomplished designer with more than a decade of experience creating print, web, logo, and three-dimensional work for a variety of clients. The Lake Murray Wildlife Museum, Jacob’s Well Natural Area, and Texas Association of REALTORS® feature my work in permanent installations. I've earned 28 certifications and have been diving for 20 years. My design firm, The Underwater Designer, provides design and photography services for clients in water related industries. I am a technical diver, designer, and underwater photographer. I help others understand the underwater world through my photography, design, and by sharing my exploration. I live in Austin, Texas and regularly travel across the country. Wherever work takes me, I'm happy to go, including international travel. I dive in all kinds of environments, from ice to caves.